Are you suspecting that you have a rodent or other type of animal living in your home? Have you found small animal droppings in your kitchen or attic? Prevents birds and squirrels from nesting under your solar panels.Birds and squirrels chew on the system wires causing extensive damage to the solar modules or causing a fire. Although termites are ecologically beneficial in that they break down detritus to add nutrients to soil. At Balance of Nature, it is our mission to make sure that you are able to conduct efficient and affordable animal proofing for your New Jersey home. Bats are on the rabies vector list. Bats are also carriers of fleas, mites, bat bugs and ticks. They may also carry disease in their feces and urine such as leptospirosis and salmonella to name a few. Animals such as groundhogs, opossums, feral cats and skunks prefer to burrow under a shed or deck. Our trapping program will prevent these. 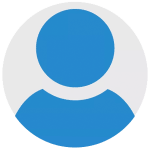 Below you will find an A-Z list of services with short descriptions and links to photos or more information about our pest control services. We do it all. Wildlife seeking refuge in your home’s attic and crawlspaces for the purpose of refuge to raise their young should be removed immediately. We Handle residential, commercial, agriculture, municipal and government pest control and animal removal problems. Contact us and we will provide you with a solution to your wildlife or insect problems! 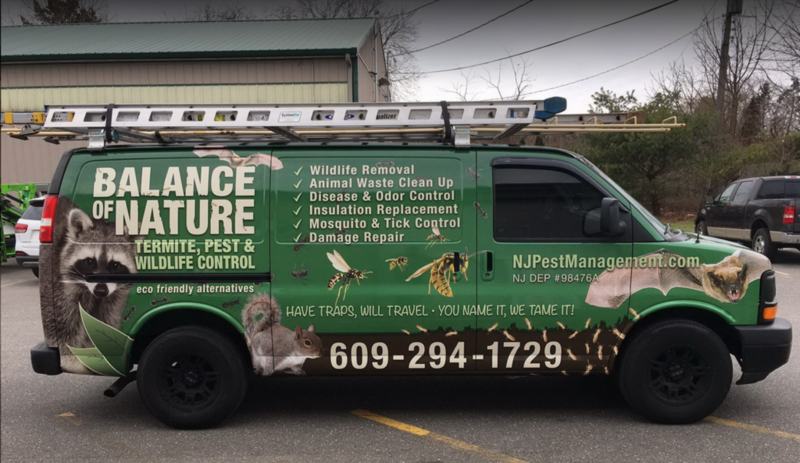 Pest Control Service | Tuckerton, NJ | Balance of Nature, Inc.
We are a New Jersey Critter Control Company. Certified as a New Jersey State Animal Control officer. A Licensed New Jersey State trapper. Balance of Nature recommends these health and safety tips! 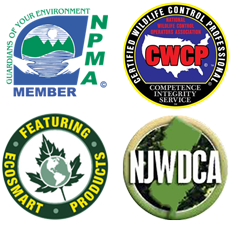 We use life and building saving chemicals for New Jersey Pest Control. GREEN PRODUCTS available for the environmentally concerned. Call 609-294-1729 today for more information. You see them disappear behind your gutter. You hear them nesting in your attic. They’ve been devouring your garden. You smell a foul odor emanating from your crawlspace. Balance of Nature is able to help you! Thank you for taking care of our Mosqito and Tick problem. Now we can enjoy our backyard. Balance of Nature has been solving our wildlife and insect problems for the past few years. From Termites in our living room to Bats and Raccoons in our attic. Balance of Nature has proven themselves as professional, effective and efficient. Thank you for coming to our rescue in a sure and competent manner. The squirrels are gone. I had the fortunate occurrence of finding, Jerry Malangone, of Balance of Nature Wildlife Control on a bat conservation website. I had considered going with another company, who by the way was double the price, when I went on the website. I found that that company was known to use in-humane methods to rid bat roosts. We were fond of the little fellows and wanted them to re-locate, but not be harmed. They had well over populated and frankly, had become a nuisance. I must say that, Mr. Malangone did everything he promised and more. He knew the ecology of the animal, was prompt, clean, and solved the problem. The bats were somewhat angered by their eviction perhaps, but were none worse for the wear. I would not hesitate to contact Mr. Malagone for any further services of this type.